In this week’s mindmap, I added nodes for hypertext theory and Bruno Latour’s introduction to Active-Network Theory (ANT), and I connected hypertext as a potential operationalized representation of ANT. Given the ubiquity of hypertext (or, more accurately, hypermedia) in today’s lived experience, I connected hypertext theory to an operationalized theory and a theorization. I don’t think hypertext has lived up to its theoretical potential, and it’s arguable whether it remains a theoretical position at all. At this point in its development, hypertext on the Web functions as a tool and a framework, not as an operationalized theory. As Dr. Romberger pointed out, hypertext as theorized in its early days was realized in applications like HyperCard, not in the ubiquitous hyperlinks of the Web. As I wrote in my reading notes for last week’s hypertext readings, I found, in the theorized reversal of author and reader roles idealized (maybe even canonized) in early hypertext theory, connections to my own theoretical stance at the time. I wrote my master’s thesis in 1997-1998 on Tristram Shandy and I concluded the essay by drawing connections between the creation and reading of web-based hypermedia and the reading and narration of the novel. At the time, I theorized that Tristram Shandy’s narrator creates an associational map of his mind in the interwoven stories he tells in a way similar to the way readers of linked hypermedia create an associational map of their interests at that moment. Readers follow links as embedded by Web designers and writers, thus writing their own narratives. 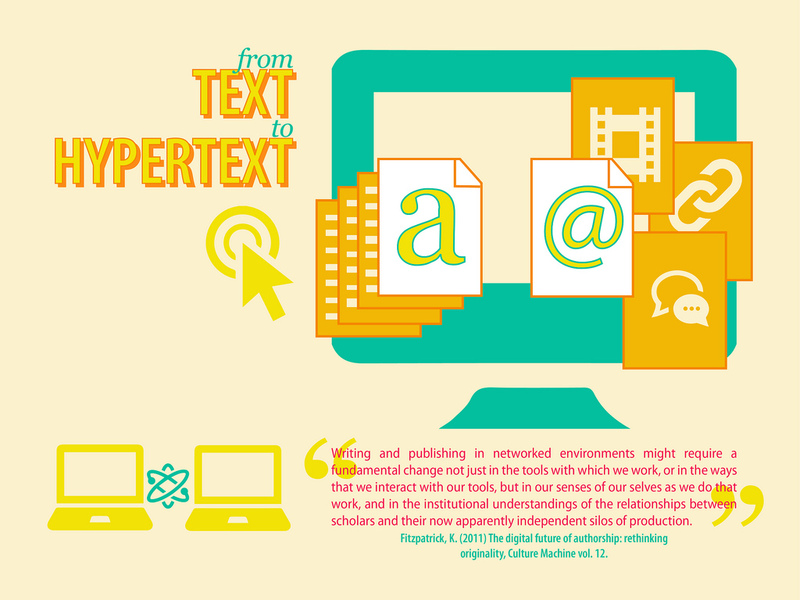 From Text to Hypertext: Even in 2011, still unable to consider hypertext beyond the print metaphor. Creative Commons licensed image from Flickr user [Ed]. Because hypermedia has become more tool than theory, operationalized or otherwise, I aligned hypertext theory with a framework and connection rather than network or node. Of course, hyperlinks are connective tissues that link text or visual nodes to other nodes, but the hyperlinks themselves are not nodes. Interestingly, little agency is afforded the creator of a hyperlinked media; the creator develops a framework within which the potential of activity and connection exists, but only the reader/viewer activates any of these potential connections by following a link. Left unproblematized, this shift of agency from creator to viewer seems to realize the potential of hypertext theory. However, as both Johnson-Eilola (1997) and Joyce (1995) note, postmodern scholars can’t and shouldn’t leave this relationship unproblematized. Hyperlinked media creators continue to have creative, political, and economic agency in the links they include and exclude, in the high-bandwidth designs they develop, and in the external and internal connections they potentialize in their work. Latour’s introduction to Actor-Network Theory provides a useful lens for examining, even deconstructing hypertext theory. As we seek to problematize hypertext theory, a quick application of Latour’s (2005) first three “areas of uncertainty” (p. 22) offers these deconstructive observations. Hypertext is a problematic “grouping”; nearly 20 years after Johnson-Eilola’s (1995) book, it’s difficult to suggest there’s a single hypertext concept. There are hypermedia like Netflix, hypertexts like CNN.com, hyperlinked texts like blogs, and meta-hypertexts like search engines. And there are different types and kinds of each of these hypertexts. Action on a hypertext is hardly clear-cut. If a blog contains comments that contain links, are those additions the action of the blog author? Does the blog entry remain a single, active text, or does it split into multiple texts when multiple people contribute? Similar questions can be posed to search engines, search engine optimizers, discussion forum posters, and more. Agency of objects and actors is not clear in hypertext. While the creator of a hypertext maintains creative agency, especially over potential connections, the reader retains quite a bit of agency over the results and meaning of the text. The interaction between networking hardware and software, search algorithms, users, and authors, all actors in the ANT sense, is complex and requires problematization. At the same time, all these actors do function together to create meaning, and, as a system, offer a complex embodiment of an active network. Meanwhile, Latour’s overall goal in Reassembling the Social, seeking to reclaim or reconstruct the social sciences, is intriguing, and I’m interested to know what my colleagues in social sciences departments might think about Latour. I imagine many find his naming of social scientists as “sociologists of the social” rather than “sociologists of association” distasteful and demeaning. With little common ground to try to synthesize, I’ll opt this week to omit summary and focus on key concepts, quotes, and course connections. Who knows, I might surprise myself by writing into something else, too! “Narrating consciousness” was surely a bit much, but I found useful parallels using Tristram Shandy’s narrator as my object of study in application of hypermedia theory. I’m marveling at a recommendation Dr. Dan Richards made during last Friday’s “Curating Online Identity” workshop focused on LinkedIn and academia.edu. He recommended including older, even incomplete, lines of inquiry and scholarship among papers and presentations we uploaded to academia.edu because one never knows how a chance encounter in previous research may come back around through the social network of scholarly collaboration. And then on Friday night I read Joyce’s words above. Serendipity. Or the instantiation of an ANT collective that included actors Dr. Richards, Tristram Shandy and Tristram Shandy, a dead Laurence Sterne, members of the RSODU attending the workshop, Webex, and the computer terminals and network hardware and software than enabled my presence from a distance. Either way, I’m sold. The thesis gets a place in my academia.edu profile. I wrote this note to myself after reading that statement: “An interesting prescient moment? My professional role [as Web Manager] is to convert what was once considered an egalitarian tool for social change into a diversion provided by the infotainment industry. Well, maybe not that bad, but it’s an uncomfortable parallel.” It is uncomfortable. One important result of reading this week on a tool with which I am intimately familiar is to make me uncomfortable with unproblematically making one hypermediated page after another in a fairly large, fairly comprehensive website. What agencies do I too readily take for myself that should be left to the visitor? More to the point, what visitor agencies do my creative efforts omit or deem meaningless or powerless as I design information architectures and implement wayfinding options? What political boundaries and/or economic realities am I activating or exacerbating, for better or for worse, in my professional role? These are questions that I’m beginning to ask of myself, my tools, and my job. Crossing discursive boundaries requires genre tracing (a la Spinuzzi, 2003) through an activity system and understanding the unique aspects of boundary genres that enable understanding of disparate discourses. Hypertextual structure (by which I’d suggest Johnson-Eilola was defining what is now known as a group-sourced wiki) encompasses these several theoretical models as a boundary genre. I found Joyce’s (2001) Othermindedness a little, well, otherminded. The text lacked a certain scholarly tone, but the result was accessible, if dated and difficult to resolve with the author of Of Two Minds. However, I found this prescient nugget in which Joyce predicts what we now know to be true: that the ability to navigate search in the digital age is far more important than the ability to recall facts and data. When I make the decision to use Google as my search engine of choice, what mediating choices have I made about what’s available to me and how? When I add a citation to my research collection using Zotero, what information have I included about how and why I conducted the search and why the source is important in the context of that search? These have become questions that are more important to me, especially in the early stages of research, than what the source actually says. Being able to recreate the search is vital to scholars and to those who follow our research; documenting the terms and scope of the search (and the political and social mediating decisions made along the way) are becoming of utmost importance to me as a digital scholar. These group formations must be active to leave traces, and such activity matches Foucault’s insistence that discursive formations be systems of division or dispersion among statements (Foucault, 2010/1972, p. 38). Another similarity to Foucault is Latour’s unwillingness to allow social science a “real” or typical society (to which all others are considered inferior or unreal). In this statement I recognize Foucault’s unwillingness to allow the history of ideas to consider either some original ideal from which all ideas are descended or some ultimate idea to which all ideas ascend. Both Foucault and Latour engage in relativistic understandings of ideas and societies, in which meaning is found in differentiated relationships among statements (Foucault) or among groups (Latour). Bazerman, C. (2004). Speech acts, genres, and activity systems: How texts organize activities and people. In Bazerman & Prior (Eds. ), What writing does and how it does it: An introduction to analyzing texts and textual practices (pp. 309-340). New York, NY: Routledge. Hocutt, D. (1998). “A tolerable straight line”: Non-linear narrative in Tristram Shandy [Unpublished master’s thesis]. Richmond, VA: University of Richmond. Bassil-Morozow, H. (2012). The trickster in contemporary film. East Sussex, UK: Routledge.